The Air Mattress designed for your car. Turn your back seat into a bed! 53 x 32 x 4 inches after inflating. 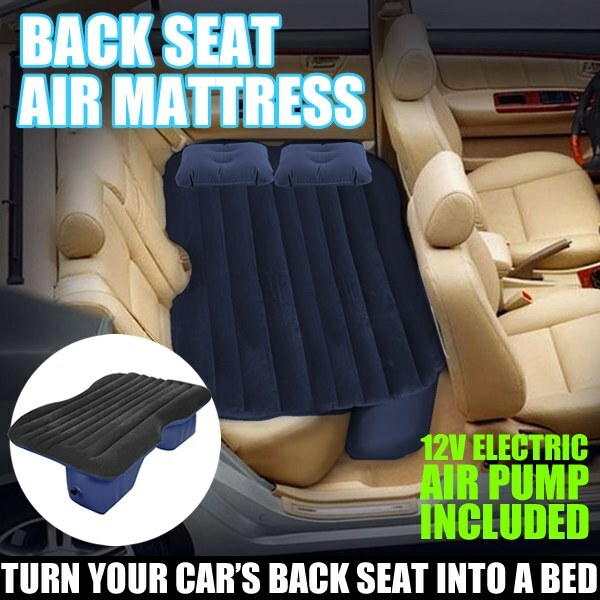 The Back Seat Air Mattress instantly turns your car&apos;s back seat into a bed! Just lay it over your back seat, then inflate it using the INCLUDED 12V Air Pump, and you&apos;ll be ready for a comfortable back-seat sleep in under 60 seconds. The unique design allows the mattress to lock into place and turns narrow, sloped back seats into a nice level sleeping platform. The Back Seat Air Mattress is great for overnight stops on road trips, car camping, or even just taking a nap in the back of your car. 1x Back Seat Air Mattress. Measures 53" x 32" x 4"